In Brazil they started kicking around the ball, and the host nation was off to a good start. The country is now the host for the World Cup in the biggest sport in the world and if that wasn’t enough, in just two years’ time the Olympics too are coming to Brazil’s most legendary city. Thus, you’d be forgiven if you’d think that these days the rest of life in Rio comes to a standstill. Luckily, far from it; there’s plenty to do for the culturally active visitor as well – there’s only to figure out if the sightseeing should to be done before or after the futébol. 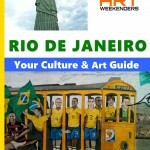 The information in this article and in-depth presentation of the major cultural and art attractions of Rio are now available in the Art Weekenders downloadable travel guide – including the listing of current exhibitions in the city. 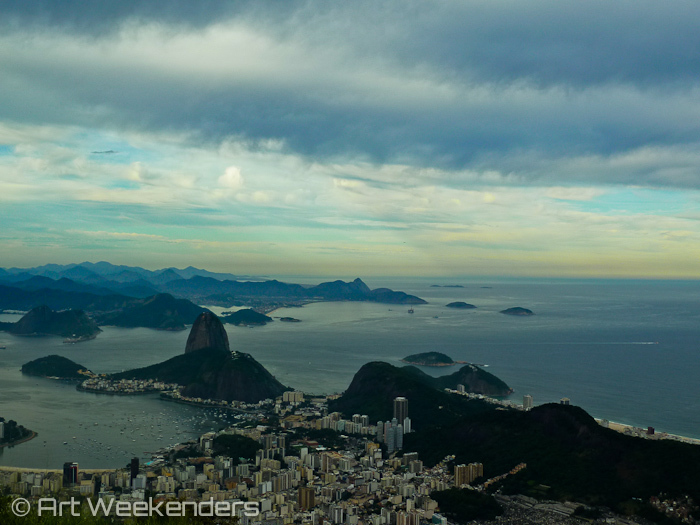 It’s all there for you to take along on your visit to Rio: Art Weekenders Cultural Travel Guide to Rio de Janeiro. While many will hit the crowded beaches of Copacabana and Ipanema, some time should also be put aside for the city’s rich cultural offerings. In this article we take you through the urban diversities of the different suburbs, and if you are interested in knowing where the city’s art is, check out our post Rio’s 21 Must-See Art Museums. It’s easily forgotten that Rio also has its share of cloudy days, especially during the ‘Brazilian winter’ in June and July, making it the perfect time to explore its culture and museums – just like we did two years ago during our trip through Brazil on our South American journey. Rio de Janeiro is endearingly called ‘Cidade Maravilhosa’, the “Marvellous City”. If you ever pondered over why it ended up with this name, to a certain extent it’s all obvious, it’s a city with wonderful sights and a perfect setting. Yes, it’s all truly marvellous really. For those who wonder, the name in any case is coming from a song written back in 1935 by André Filho for that year’s Carnival. The ‘Cidade Maravilhosa‘ knocks visitors down off their feet ever since: be it for its beauty or the lifestyle, it’s simply a very enjoyable city almost everywhere you turn (although not without a fair share of social problems, but that we mainly leave for another story). Rio de Janeiro is a city that needs to be absorbed through its natural sights in the first place. 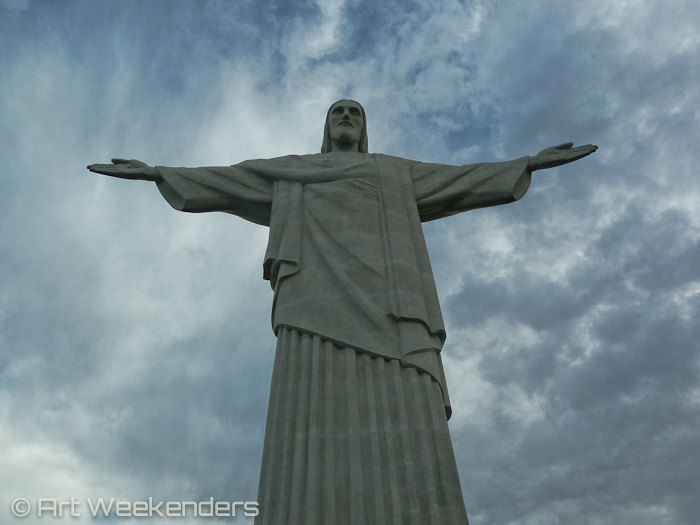 For first-timers – but certainly likewise for returning visitors – the city is best enjoyed from the top of the ‘Corcovado Mountain’ (A; location stated in map below) at the feet of the ‘Christ the Redeemer’, the statue that is one of the New Seven Wonders of the world. This spot from where you can absorb the city in all directions is almost unrivalled in the world, the 360 degrees view captivates everyone, making it one of the most memorable sightseeing experiences in life. Another way of enjoying the city is from the top of the Sugar Loaf Mountain (B), the other symbol of this gorgeous city. It’s another perfect spot for admiring the views from a beautiful angle: if you want to do it right you plan your trip around sunset, just to transform a wonderful vista into an outright spectacular one. 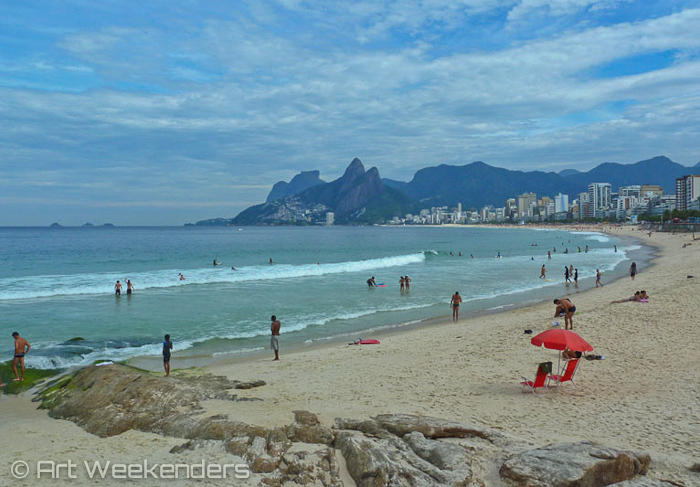 Rio is in any case more than the three ‘dominant’ must-sees and the beaches. While it’s a big city it’s also surprisingly easy to cover it within a relatively short time, at least if you are satisfied to concentrate on the real must-sees. The reason for it is that while it’s vast, the areas interesting – and recommended – for foreign visitors are fairly compact, mainly centered around the central district, Centro (C), and the surrounding neighbourhoods. Let’s have a look at them all. For most visitors it could be said that Rio de Janeiro can be divided into two distinct areas of interest, the beach areas and all the rest. Most visitors end up staying in the southern districts along the famous beaches made up of the neighbourhoods of Copacabana (D), Ipanema (E) and Leblon (F). This is the area where life moves out to the gorgeous seaside by day and into the bars and restaurants by night. Around here is where the beautiful people of the city gather and also the area where safety is not of a higher concern. But there’s more to these districts than just the leisurely lifestyle of beach, dining and shopping. New cultural institutions are mushrooming and all three boroughs have an ever-increasing number of art galleries popping up constantly, covered in our article about Rio’s art highlights. Where the Atlantic meets the Guanabara Bay, at the foot of the Sugar Loaf Mountain is the cosy, relaxed neighbourhood of Urca (G). While coming here is usually triggered by the intention of taking the funicular up to the Pão de Açucar, visitors will quickly realise that the area is fun and quirky in its own right. This is the area where the first Portuguese settled in the area and to this day it maintains a charm from a different time. 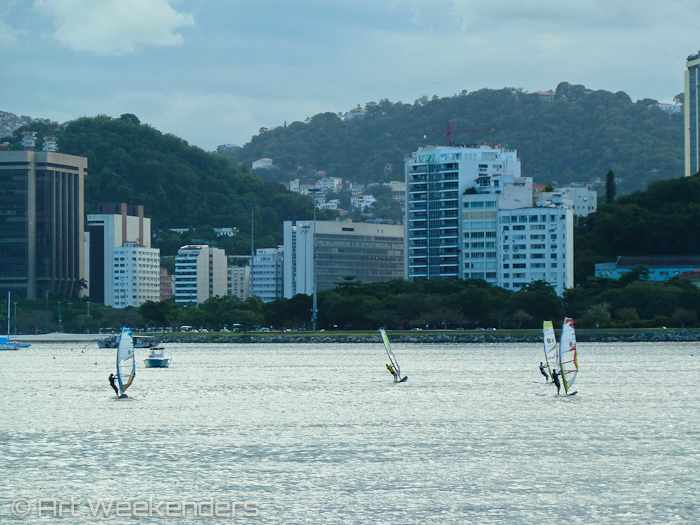 It’s a residential area of the affluent middle class; life here is more slow-paced than what the rest of the city offers and in terms of cultural experiences the highlight is all about enjoying the good life: there are leisurely bars and relaxed restaurants serving seafood, often with views across the bay to Botafogo and – not the least – the Cristo Redentor high up on the top of the Corcovado above the city skyline. There’s not much on offer for the art interested visitor, but the Earth Science Museum is housed in a majestic building with curved staircases at its front entrance, lined by marble statues. Surfing near Botafago, Rio de Janeiro, Brazil. On the way north towards the Centro – following the shore and the calm bays that create some of the nicest city beaches you ever come across – the neighbourhoods of Botafogo (H) and Flamengo (I), two affluent middle-class areas, spread out majestically. These are some of the oldest parts of the city, but you won’t find many reasons to think so, the architecture is mainly modern an life in general is dictated by commerce. 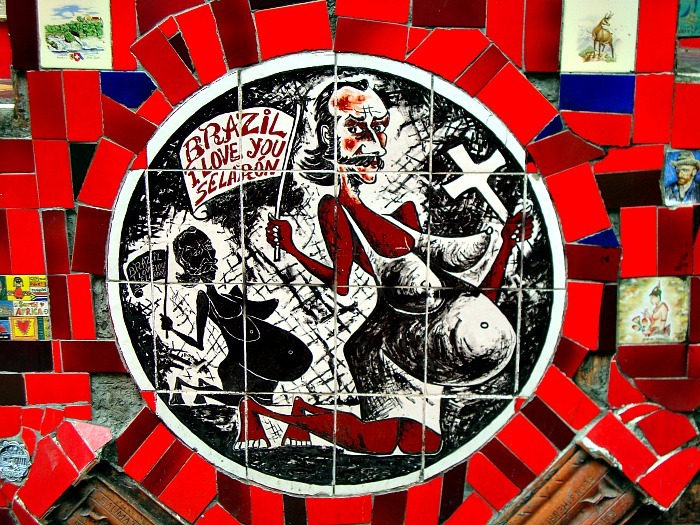 While today both neighbourhoods are predominantly calm, they both got their names linked to historical conflicts: Botafogo meaning ” setting on fire” (reference to old conflicts at the time of the settlement) and Flamengo being Portuguese for Flemish, a sign of old conflicts with the Dutch invaders. Both areas offer plenty of opportunities for relaxing and admiring nice views, and more and more reasons for culturally active initiatives too. Botafogo is the home for the acclaimed Museu du Índio, the best overview in the country of the indigenous people of Brazil, presented through well-thought through multimedia exhibitions. In Botafogo you can also visit the Home of Rui Barbosa, a museum dedicated to the life of the famous Brazilian journalist and diplomat. Similarly, the Museu Villa-Lobos offers a great insight into the life of Brazil’s biggest classical composer. In recent years these affluent areas are more and more taking a central role in Rio’s art scene, where new art initiatives are opening in form of cultural centres like the Oi Futuro, while also many new art galleries opened in recent years, especially in Botafogo. We discuss them further in our art guide for Rio de Janeiro. Rio de Janeiro is much more than just beaches and nice views from fantastic mountain tops, it’s also a culturally rich city that combines its old colonial heritage with a steadily developing modern side. Many of the important cultural sites are clustered in the Centro, the city’s Portuguese heritage old town, an area which is rapidly transforming into a mixture of old and modern, a hang-out of the rich and the poor. Centro is lively and busy by day, but in general it’s advisable to avoid it by night, when the danger can be around any street corner, with the exception of the area around Cinélandia. 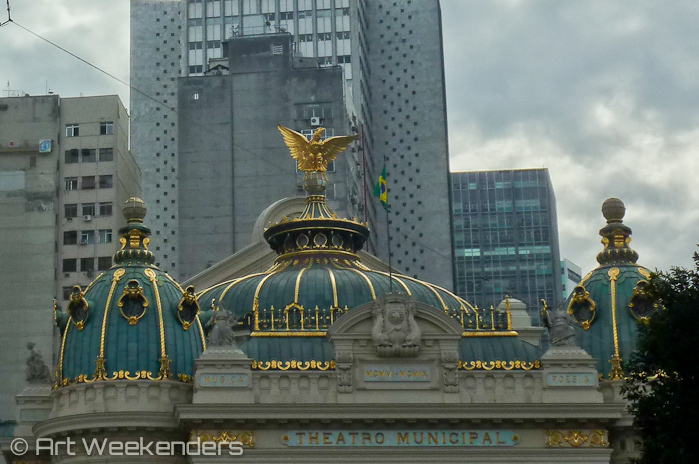 The most important focal point of the centro is Teatro Municipal, without doubt the symbol for the days when Brazil developed as an independent republic. 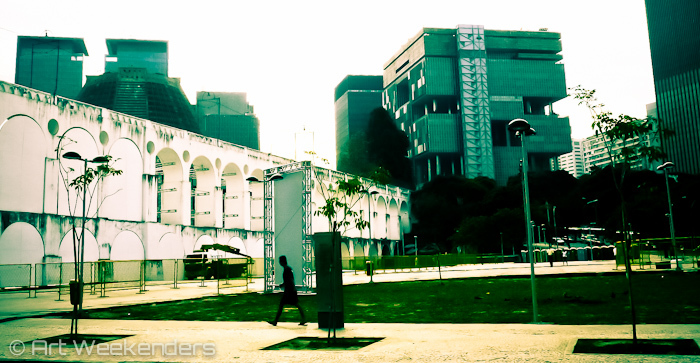 The Centro is also the home of the most important cultural institutions of the city, clustered within an easily walkable area; we discuss them in depth in our cultural highlights article for Rio here. Centro is also the place for many improvised open air exhibitions, especially right outside the metro stop Cinélandia, it’s easy to randomly come across a great photo exhibition or an improvised street performance. Rio’s de facto nighttime entertainment area is Lapa, but also the place for many of the historic monuments from the city, where the Arcos de Lapa (J) is the visually most prevalent one (see below). Lapa otherwise is the place where you come to by night to enjoy Brazilian music and where Fundição Progresso is the most important cultural institution promoting Brazilian music and dance. A relatively new, but very popular attraction is the so-called Selarón Stairs, the creation of one person against all the senses of logic (see below). Arcos de Lapa – Rio de Janeiro, Brazil. You’d be excused for thinking that you suddenly ended up in Roman times and not in the heart of Rio. 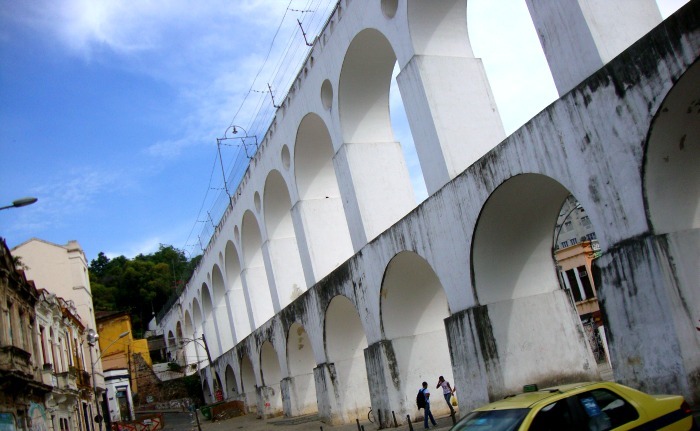 The Arcos da Lapa is a Roman-style aqueduct built in 1723 to help solve the problem of water shortage in the city, by re-directing water from the Carioca river to the rest of the colonial Rio de Janeiro. The construction is 17.6 meters high and 270 meters long, consisting of 42 arches. The Carioca Aqueduct – as it’s also called – was not the great success story as expected, but nonetheless it became a symbol of the city before the Cristo Redentor wasn’t even intended to be erected. Today the Arcos de Lapa serves as the viaduct of the Santa Teresa tramway, the cable car connecting the lower parts of the city with the neighbourhood of Santa Teresa up on the hill. Some 250 steps are connecting Lapa at the outskirts of downtown Rio with the neighbourhood of Santa Teresa, situated at a higher elevation overlooking the old part of the city. What used to be a quite dull and fairly dangerous stretch of stairs is nowadays one of the most colourful attractions of this colourful city. 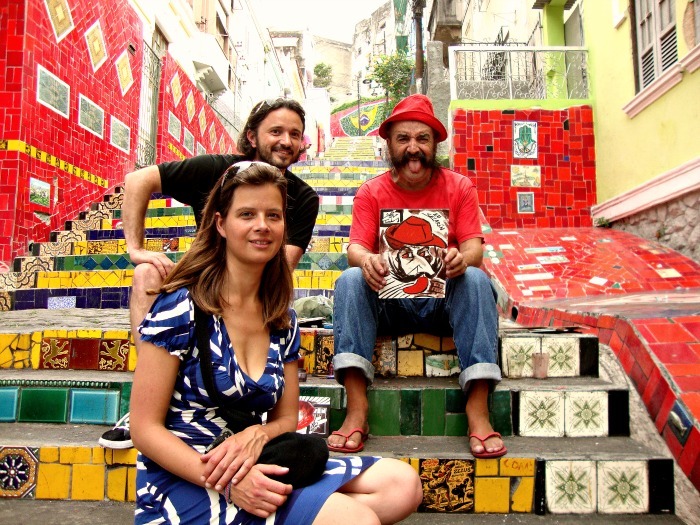 The stairs by a twist of faith became the accidental art project of a Chilean man, who ended up in Rio and found the meaning of life by renovating the staircase. Unfortunately the story had a tragic ending, but the legacy of Jorge Selarón lives on through his stairs. You can read more about Selarón’s Stairs here. You can reach the Santa Teresa neighbourhood – on the top of the hill with the same name – or via the Selarón’s Stairs or via the cable car – the ‘bonde‘. The cable car departs form the Largo de Carioca Square in Lapa and via the viaduct it passes through the colourful neighbourhoods of Santa Teresa. Not surprisingly, this used to be a popular attraction with tourists. However, after an accident in 2011 with fatalities the bonde has been on a standstill, but there are plans to re-open it when new cars have been re-instated. 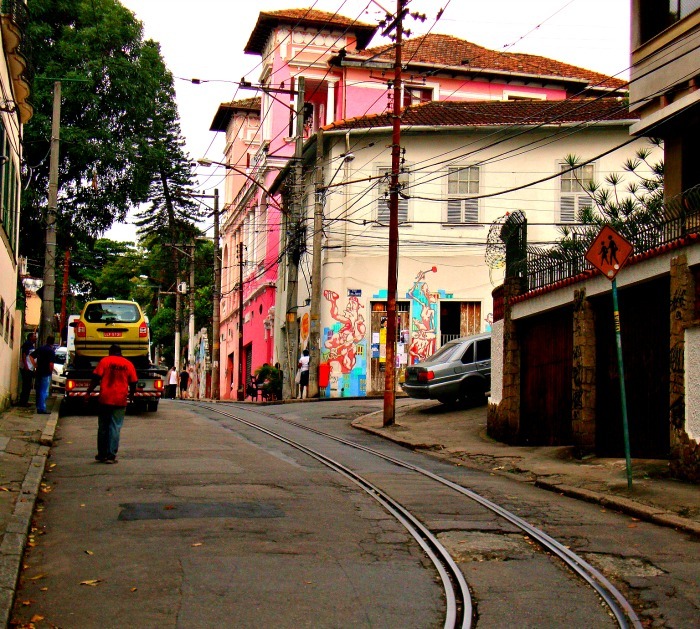 Santa Teresa (M) is by far the city’s most picturesque neighbourhood. What used to be an upper-class district in the colonial days lost that glimmery shine a long time ago, but these days it is a hotspot for artists. There are several galleries and ateliers and the people living here can generally speaking be considered as bohemic. 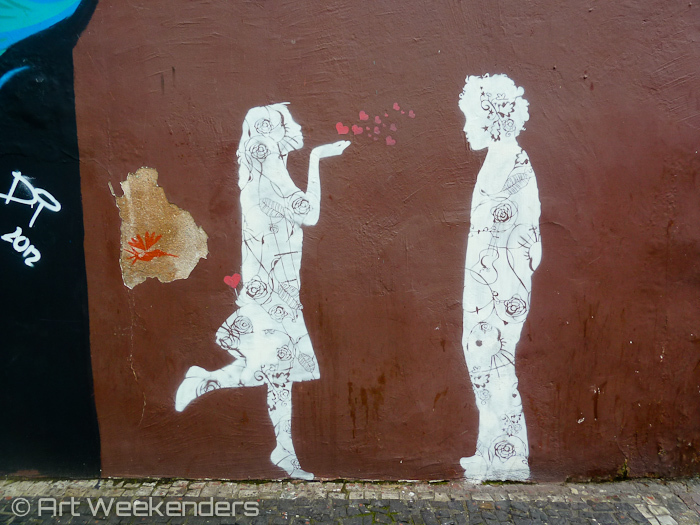 Santa Teresa is also a great spot for street art of all kind, be it the typical murals, but also the smaller details you find here and there, quirky ideas from artsy minds. Street art in Rio de Janeiro, Brazil. One of the most famous residents of the area was Raimundo Otoni Castro Maya, an art collector and great personality. Today his old mansion is turned into the Museu Chácara do Céu, which you can read more about in our Rio art guide. While Santa Teresa is a super-cozy neighbourhood, a finger of warning needs to be raised. Unfortunately, it’s not only popular with visitors, also shadier characters from Rio’s extensive shady life hunt here, so it’s highly advisable to be on the alert and try to stay in groups and avoid coming here by night. The northern neighbourhoods are rarely explored by visitors, this largely residential part of the city has little to offer in sights and since favelas are scattered all around, in many cases it’s advisable not to hang around too much unless you are familiar with your whereabouts. The main attraction (and there aren’t many more), especially in this futebol-times, is the Maracaná (M) stadium, which is also worthwhile visiting from an architectural point of view, if you happen to be less interested in football. Another worthwhile and interesting highlight in the north is the Museu Nacional, where you’ll find everything from dinosaur fossils to stuffed animals and meteorites. This used to be the royal palace, but the days of the monarchy are some 130 years back in time, and the building isn’t what it once used to be. Across the Guanabara Bay Rio’s sister town Niteroi (N) is awaiting the visitor. While parts of it is a city with a pleasant enough atmosphere, the main reason for taking the ferry here – or the bus over the bridge if you so please – is a visit to the Contemporary Art Museum. Even for non-art oriented visitors this will be a memorable occasion, we promise. Why? See further in our art guide for the city. 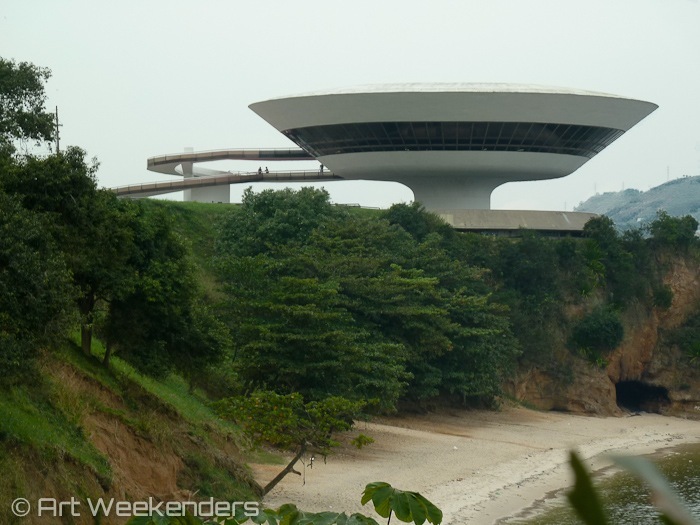 The contemporary art museum in Niteroi, Rio de Janeiro, Brazil. What would a tour of Rio’s neighbourhoods be without a proper dicussion of it’s many favelas? No doubt a hint of controversy is involved here, should poor-people’s neighbourhoods be exploited for the purpose of tourism? There’s also a fair amount of mysticism around the term already, not the least made immortal by the movie-hit ‘Cidade de Deus‘ (“City of God”), and undoubtedly the term carries with it loads of emotions, among them some fear. 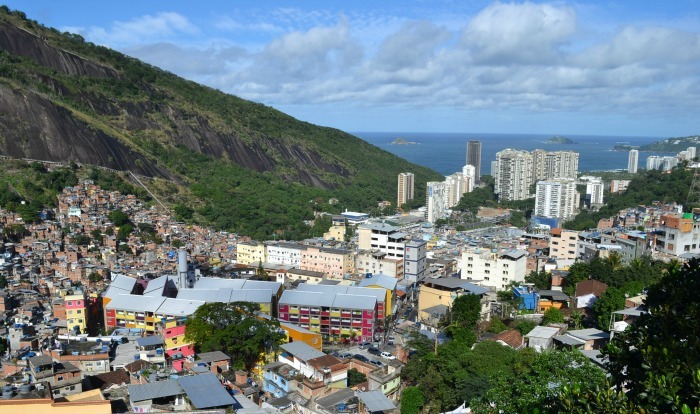 Most favelas are crime-ridden, but it’s also important to remember that these are neighbourhoods where also poor but decent people live their regular lives. For the background information it’s good to know that some 6% of Brazil’s population live in this kind of shanty towns and only in Rio de Janeiro there are approximately 700 of them. For many years most of the favelas were controlled by crime gangs lead by drug lords, and despite serious efforts in many not much has changed. In most of them circumstances are relatively safe, although crime does exist and therefore, it’s not advisable to jump into the unknown and visit any on your own. The term ‘favela’ is coming from Bahia and relates to the tree with the same name, which gave name to the hill where freed slaves settled. When the migration down to Rio de Janeiro in the 1880s happened, the name followed with them and stuck. For many years these slums were lawless areas, where the authorities had little or no presence. Now a pacifying program is in place with the goal to improve favela life. In Rio the biggest and safest favela is ‘Rocinha’ (O) and since the early nineteen-nighties tour companies take tourists there. So why should you actually take part in any of them? The purpose of the tours is to explain and inform you about life in the favelas to increase the awareness of the situation for the public. Tours take place with vans after you’re being picked up from your nice comfortable hotel. 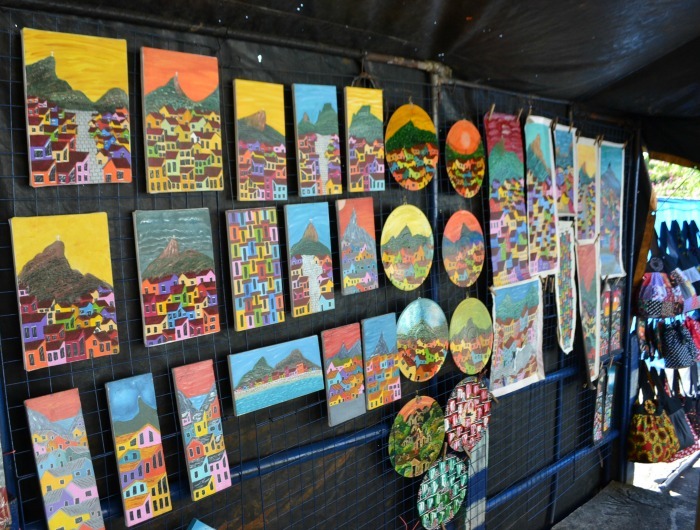 Once in the favela, you’re free to stroll around in designated areas, meetings with locals are arranged and a great bonus is that there’s also the possibility to buy souvenirs in form of for example local art, which is a direct mean of giving back to the community. The hillside setting is an extra plus with spectacular views. In our opinion these are tours not to be missed, you end up learning a lot and knowledge is always better than ignorance. You need to book your tour in advance via email (info@favelatour.com.br, phone number in case needed +55 (21) 3322-2727 / 99989-0074/ 99772-1133) to ‘Favela Tour’, the original and most reputable operator. They organise tours twice daily (9 am and 2 pm) , both tours pick participants up from the hotel where they stay at. The price you can expect at this stage is around R$ 80 (approximately € 26 or US$ 35). We hope you enjoyed this tour through Rio de Janeiro’s neighbourhoods with a cultural purpose in mind. This is a fascinating city, be it for its beauty, good life, happy people or even for its social problems. One thing is for sure, it’s one of a kind, there’s no discussion about it. To honour the city, we put together the best information for the culturally active traveller in our downloadable travel guide. All you need to do is click on this link and follow the few steps needed to get the link for downloading the pdf onto your phone or tablet (compatible with all brands and models). 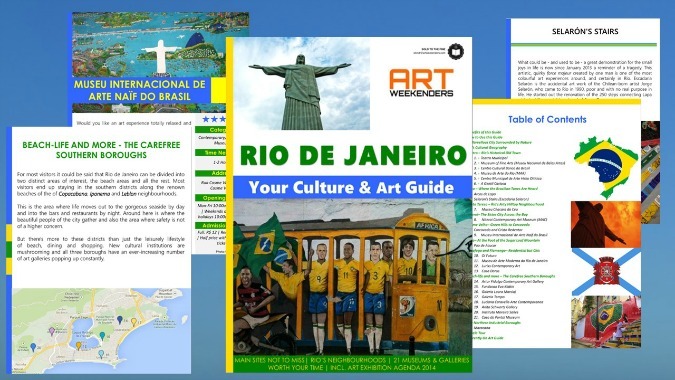 As part of our introductory offer, the guide is available for free until Sunday June 22nd – we’d be happy to see you taking it along with you: Art Weekenders Cultural Travel Guide to Rio de Janeiro. In our guide you’ll find among others also details for 21 of the most important art museums and galleries in the city, which is also available in this article here on our site: Art Guide for Rio de Janeiro. It’s our resource to everything that we think is worth knowing about when it comes to art, museums, architecture and some galleries in the city. Is there anything you think we left out, or something else you believe needs to be mentioned? Please leave a comment, we greatly appreciate it, or send us an e-mail.